Audio is saved in a Linear PCM format at 16-bit 48kHz in stereo. 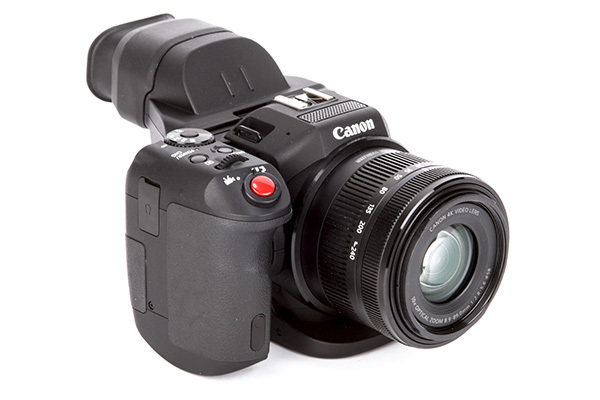 There are of course built-in stereo mics on the top of the Canon XC10, and combined with the level monitor and audio gain adjustments, this should make for enough for those want to record some ambient background sounds for their video footage. However, anything other than this will obviously require the use of some more sophisticated microphones. There is a 3.5mm input on the side of the camera, and the shoe on the top of the camera can easily support an external microphone. Another complaint at the launch of the XC10 was the lack of XLR inputs. Again, if you are complaining about this, the XC10 is not the camera for you. The 3.5mm mic input will be fine, and it isn’t like the world is short of good quality mics with 3.5mm jacks. If you really need XLR inputs there are loads of solutions available. Given the user for this camera is a first time videographer, blogger or on-the-move reportage style journalist, the XLR input is not a problem. The 3.5mm headphone jack is in an odd position on the camera’s handgrip, and as I have already commented, I’m sure a better location for this could have been found somewhere on the camera body. That said, it isn’t too prohibitive, just a wee bit annoying.